Here is my personal repair story with a happy happy ending. 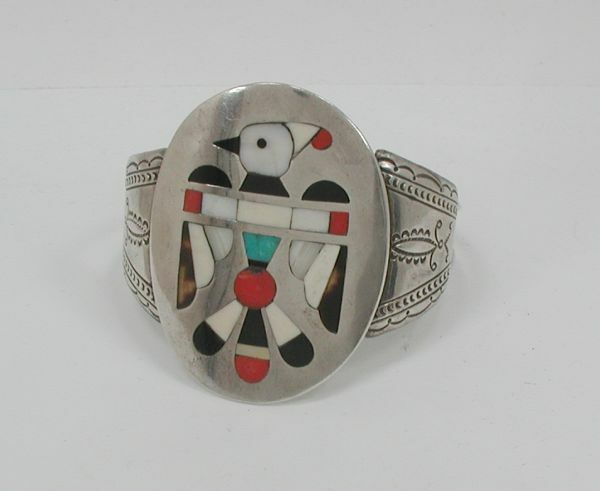 Chester Mahooty bracelet with missing inlay piece. whether or not any additional work needs to be done in order to repair the setting. That’s why we always like to examine a piece before giving a firm quote. Of course there is also the shipping charges back and forth that a customer needs to pay. For your piece, we don’t have ivory, and I’m not sure we could get it. There are, however, some shells that have a creamy appearance and might work nicely in this instance. I believe we also have a white coral that has that creamier appearance, without going into the orange tones. If you can get a piece of ivory, we can cut it and set it. I can see that your center coral has a little issue, too. If it’s not uneven on the surface, it might not be a problem, but if you’d want us to replace that, it would be $25 (red coral is expensive, but we do use the real thing – not dyed). 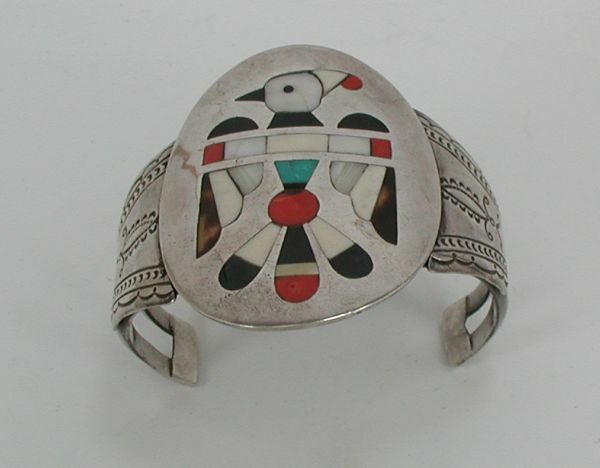 The bracelet is a 1960s or early 1970s Zuni inlay cuff by the late Chester Mahooty. 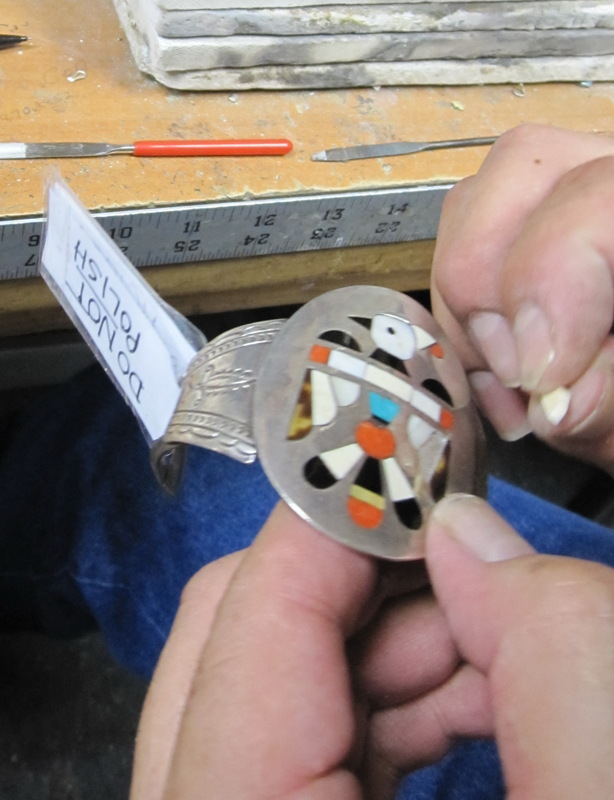 On the bracelet, the only thing I want done is to have the one cream piece of missing inlay replaced. Maybe it was ivory (I think ivory was still available at the time he made this as was the tortoise shell that is also in the piece). Since ivory isn’t an option, you suggested using a similar ivory colored shell to match the piece on the opposite side? You’ll see he used cream and white inlay but it is the cream piece that is missing. 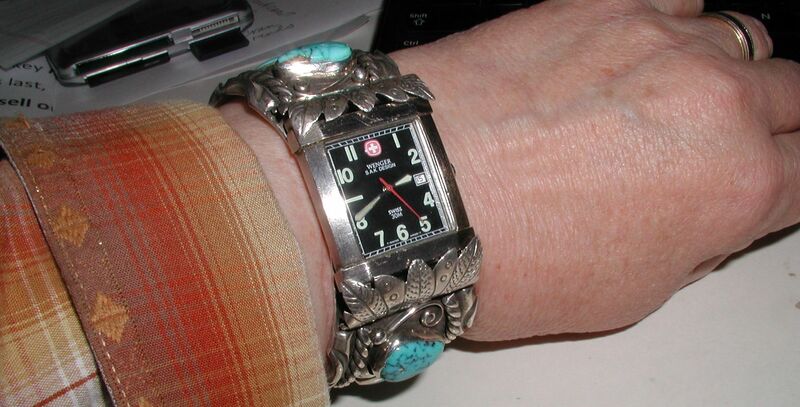 Your bracelet arrived here safe and sound. First, I feel very clear on what you want for your bracelet, which is a beauty! I love the stamped sides. We will do our best to match with something. The guys are willing to look through their personal stashes to see what they can come up with. Henry will do the inlay a little differently to avoid any errant polishing. They usually would grind the surface of the stone after setting it into the bracelet, but he will cut and finish the stone completely out of the setting, then glue it in. The stone will be a little thinner (depth-wise, but you won’t see it) than doing it the regular way, but this will ensure that the bracelet never gets near the grinder. I do need to mention that there is a crack in the bird’s head, kind of through his eye and cheek, another crack in the turquoise chest, the chip previously mentioned in the coral belly, and a couple of other teeny tiny chips and cracks. Nothing unusual nor in need of repair – I just like to mention these things before it goes back into the shop so you’re aware. I’ll have the guys alert me if they see any weak settings, but I don’t believe they will. The rest of the settings look very good to me.